I've been living with this drawing for so long I can't even be bothered explaining it. Suffice to say it was a grower. It grew and grew and grew. Stick your nose in and have a look around. And if you don't know by now, you can do that by clicking on the drawing and then on the green arrows in the bottom right hand corner. 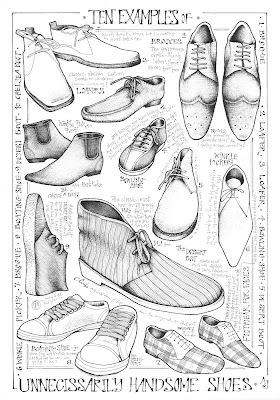 Fill your boots. I was looking through some old stuff yesterday. Throughout my life I've always made books. Books of stuff. Books about nothing much. Just about life, I guess. 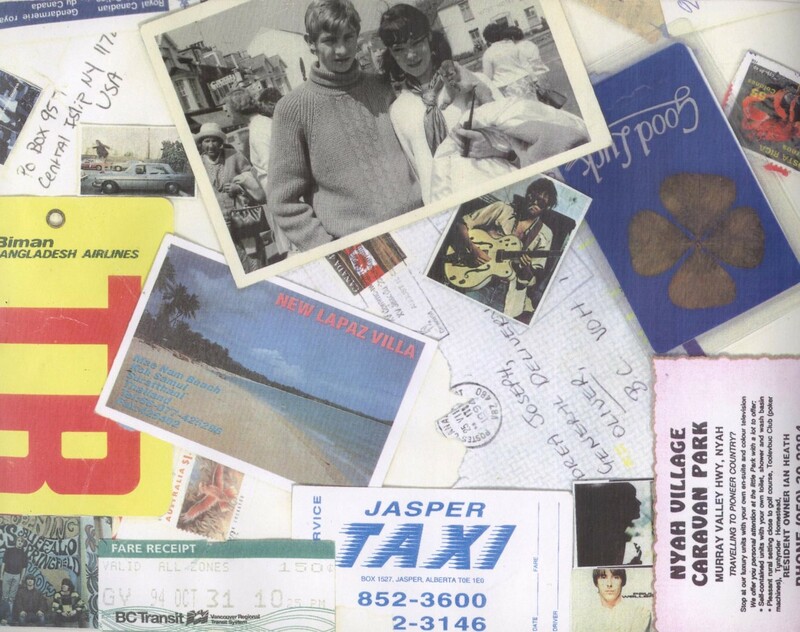 I found this one which is about 15 years old. It's jam packed with drawings, photos, thoughts and ideas. I hadn't looked through it for years. This page, particularly, made me smile. Not just because it looks like one of my drawings. And not just because Weller and Young can all be found amongst the stamps and other bits and pieces from places I've visited. But mostly because this is, without a doubt, my favourite photo of my mam and dad. Looking fabulous. Looking like a couple of young Mods. I'm getting this urge. A feeling that I might just draw this entire page in one of my Moleskines. This really was a quick drawing. Quick for me. It's all relative, of course. 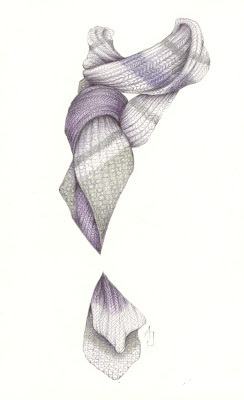 I drew this one in front of the mirror, before putting away my woolly scarves until next winter. I guess it's the closest I've come to a self portrait. But, when it came down to it I preferred the negative spaces. I'm calling this one Everyday Matters Challenge #22, draw a piece of clothing. See the rest of my challenges HERE. 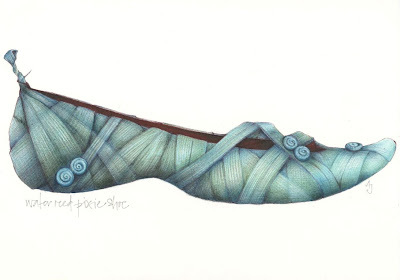 So, when I said I was not going to plug my children's book blog or draw anymore shoes, it was obviously, a big fat fib. I'm a liar. A liar. And, it seems, my pants are, indeed, on fire. Check out my children's book blog HERE! Another week passes and I still haven't produced a drawing that I want to share. 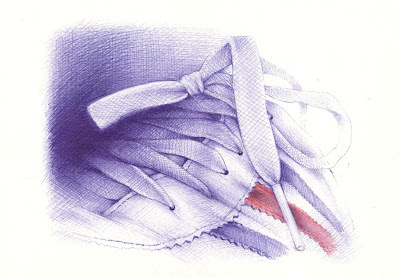 So today, once again, I found solace in a ballpoint pen and some Adidas trainers. Predictable but comforting. This is not a shoe blog. I know it looks like a shoe blog, but it's not a shoe blog. I've had such a frustrating week. I kept a couple of days free for drawing. It's not often you get the time to just draw, is it? I was so looking forward to it. But, as sometimes happens, I was completely unhappy with every single drawing that came out of that time. This is the best of a bad bunch. I'm not even going to bother posting the rest. 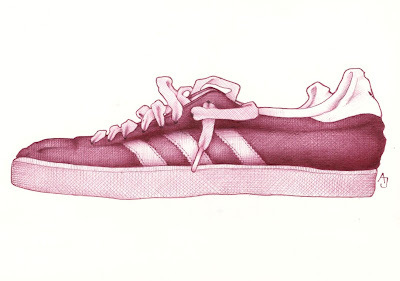 This is a quick ballpoint drawing of my most favourite trainer ever - the Adidas Gazelle. It's such a gorgeous design and they are so comfortable. In fact, a pair of these old faithfuls appeared in my very first blog post, many moons ago. See it HERE. 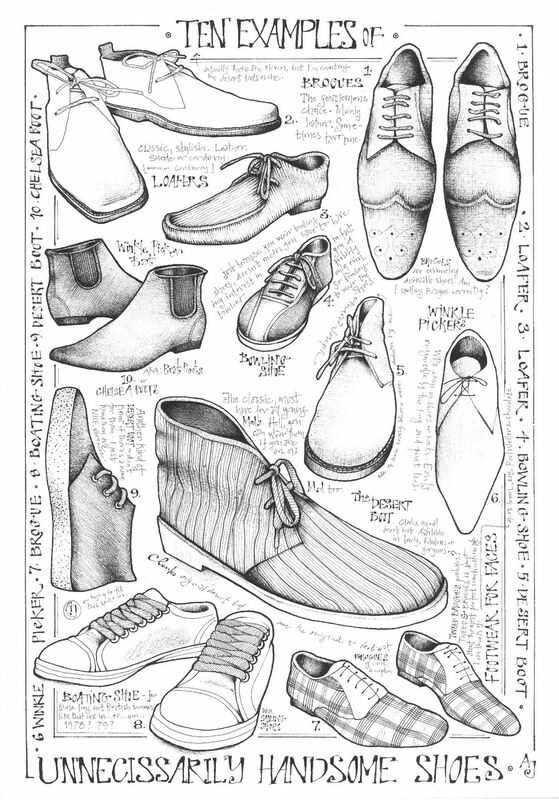 And, there are even MORE shoes over at my children's book blog HERE. Once again I need to say a great big thank you to you all - for your response to my last post and to the great feedback. It's all much appreciated, and I still have many of you to get back to. I'll get around to it ASAP. As I said then, I have been meaning to start this new 'book blog' for a long time, but I continued to procrastinate and over think things and then procrastinate some more. Well, not anymore. 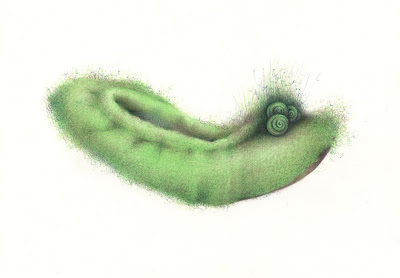 So, if you are wondering exactly what this is a drawing of, then pop over to my new blog (yikes! I'm nervous) and find out. While you are there you might, perhaps, who knows, I dunno, if you fell like, maybe, want to start following that blog? Anyway, I'd love it if you would join me. You can take a look at my new blog HERE.